SOLANA BEACH — In 2020, Solana Beach voters will get to decide whether pot shops will be permitted in the city. The City Council unanimously voted at a Nov. 28 meeting to send a ballot initiative allowing commercial cannabis retailers in non-residential zones and deliveries and certain cultivation in all zones to a vote of the people in two years. Joshua Clark started the ballot initiative on behalf of Alliance For Safe Access, gathering and submitting 1,057 signatures from residents. In order to be approved as an ordinance by the City Council or become a ballot measure in Solana Beach, an initiative must garner at least 860 signatures. In 2012, Solana Beach voters rejected a somewhat similar ballot measure, Proposition W, which would have allowed medical marijuana dispensaries in the city. Out of 6,833 votes, over 60 percent voted “no” on the measure. However, since Proposition 64 legalized the recreational use of marijuana in California in 2016, the potential ordinance takes on a new significance. Solana Beach voters approved Proposition 64 by 61.2 percent, which allows cities some discretion in regulating marijuana-related activities in their jurisdiction. As such, the City Council moved to prohibit marijuana delivery, cultivation and distribution in Solana Beach in 2016. If approved by voters, the new ballot measure would replace the prohibitive ordinance and allow up to two duly licensed cannabis businesses to open up shop in the city. A single business could operate as both an adult-use cannabis dispensary and a medical cannabis dispensary. 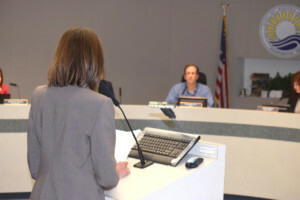 The potential ordinance would also implement a regulatory and enforcement system, and allocate tax revenue generated by the cannabis businesses to “the public safety needs” of Solana Beach, such as law enforcement and fire departments. “Residents should not be forced to acquire a lawful product from illegal operators with unsafe & untested products, that do not adhere to any regulations or potential age restrictions,” the statement read. Five local residents waited until almost 10 p.m. to hear the item at the meeting and speak against the initiative, encouraging the city to order a report to assess the various fiscal, land-use and commercial impacts of the ordinance. This option would have brought the matter back to the council in 30 days or less. Megan Rapp, a 17-year-old Torrey Pines High School student who often speaks to younger students about the risks of drug use, worried about the visibility of marijuana stores in a city of Solana Beach’s size. “Our job to educate younger students will be significantly harder if there are commercial marijuana businesses in Solana Beach,” Rapp said. 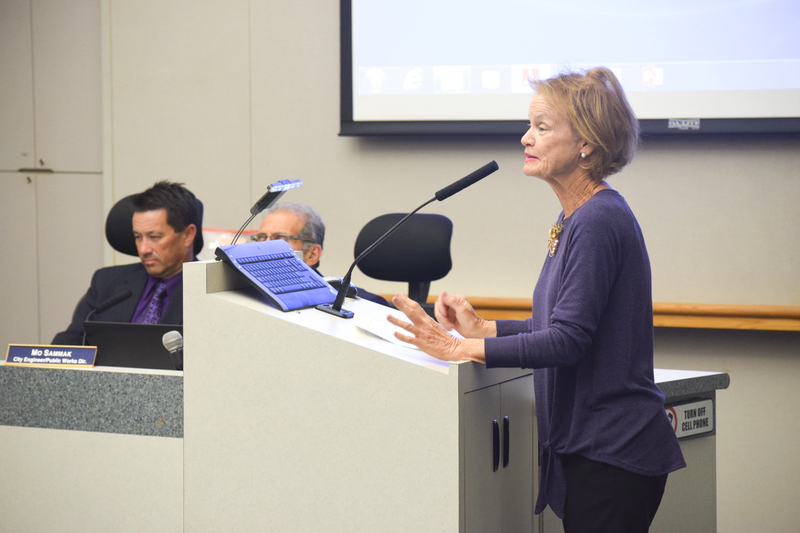 Resident Peggy Walker called the scope of the initiative “unusual.” It would allow dispensaries in five different zoning areas, including office professional and light industrial. “That means pot shops could impact a widespread part of our four by four square miles,” Walker said. “People were led to believe that unless they signed, that pot shops would be allowed within 600 feet of their schools, where in fact, pot shops weren’t allowed period, in our city,” said City Councilwoman Jewel Edson, mentioning the various posts written by residents about the incident on social media. Josh Clark wrote a Facebook post in mid-March, directed at the California State University San Marcos Facebook page, soliciting college students to gather signatures in Del Mar and Solana Beach in order to qualify a ballot initiative. In the post, Clark said petitioners would be paid $4/signature, “no experience necessary.” Clark submitted 39 petition sections to the city. Edson said that by the time people realized they could withdraw their signatures, the petition was already filed. According to the staff report, the city received seven written requests to be removed from the petition, which were granted. “It’s disturbing to see the pot industry come in from out of town, pay signature gatherers, also from out of town, to come here to initiate this petition,” Walker said. Clark could not be reached for comment. The City Council agreed to initially bypass the 30-day report and send the ordinance to the ballot, with concerns that a report could be considered out-of-date by 2020. Council members are hoping to pursue a report at a later time that might assess the potential impacts the ordinance could have on the community. “I think that people are fine in concept and theory about legalizing marijuana, but when it comes to having dispensaries near their homes, shops and schools … that’s a different story,” she said.